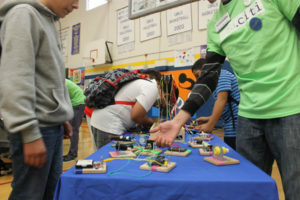 A Successful Launch at Aki Kurose Middle School! 35 volunteers from seven member companies joined us last Thursday. 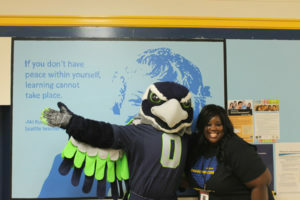 We appreciate that you stuck with us through the schedule change as we started our work with Seattle Schools. 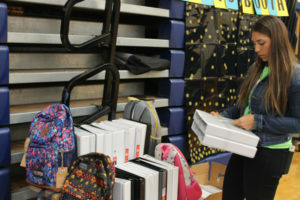 Our first campaign raised more than $40,000 for our partner Communities in Schools to support students and provided thousands of dollars of school supplies. We hope that you learned something new, made friends with a student, or high-fived a teacher for being awesome. The feedback from Aki Kurose’s staff has been wildly positive. Teachers and administrators alike, were deeply appreciative of you sharing your career path with students. The supplies were definitely a hit with the students, closely rivaled by Blitz. And who doesn’t love pizza and ice cream?! Check out our recent press on Geekwire and follow us on Facebook and Twitter. Your Feedback: Please take 90 seconds to fill out this survey so we can provide fantastic additional experiences. Volunteer Regularly: sign up here to learn more about volunteering regularly with Communities In Schools of Seattle. Donate: contributions get kids more extracurricular activities or can be used to address family emergencies that keep them from learning.